Learn how to get started with MicroPython firmware on the ESP32 and ESP8266. We’ll introduce you to MicroPython, show you the differences between MicroPython and regular Python, and how to program your ESP based boards with MicroPython using uPyCraft IDE. After completing this guide, you’ll have your first LED blinking using MicroPython. MicroPython is a re-implementation of Python 3 targeted for microcontrollers and embedded systems. MicroPython is very similar with regular Python. So, if you already know how to program in Python, you also know how to program in MicroPython. Apart from a few exceptions, the language features of Python are also available in MicroPython. The biggest difference between Python and MicroPython is that MicroPython was designed to work under constrained conditions. Because of that, MicroPython does not come with the full standard library. It only includes a small subset of the Python standard library. However, it does include modules to access low-level hardware – this means that there are libraries to easily access and interact with the GPIOs. Additionally, devices with Wi-Fi capabilities like the ESP8266 and ESP32 include modules to support network connections. Python is one of the most widely used, simple and easy-to-learn programming languages around. So, the emergence of MicroPython makes it extremely easy and simple to program digital electronics. If you’ve never programmed digital electronics before, MicroPython is a good starting point. One great feature of MicroPython is that it comes with an interactive REPL (Read-Evaluate-Print Loop). The REPL allows you to connect to a board and execute code quickly without the need to compile or upload code. In our projects, we’ll use MicroPython with the ESP32 and ESP8266 boards. ESP32 is the successor of the ESP8266. So, at the moment, not all features are available in MicroPython to take the most out of the ESP32 – it’s still an ongoing project. However, it’s very usable and you can make a lot of projects with it. 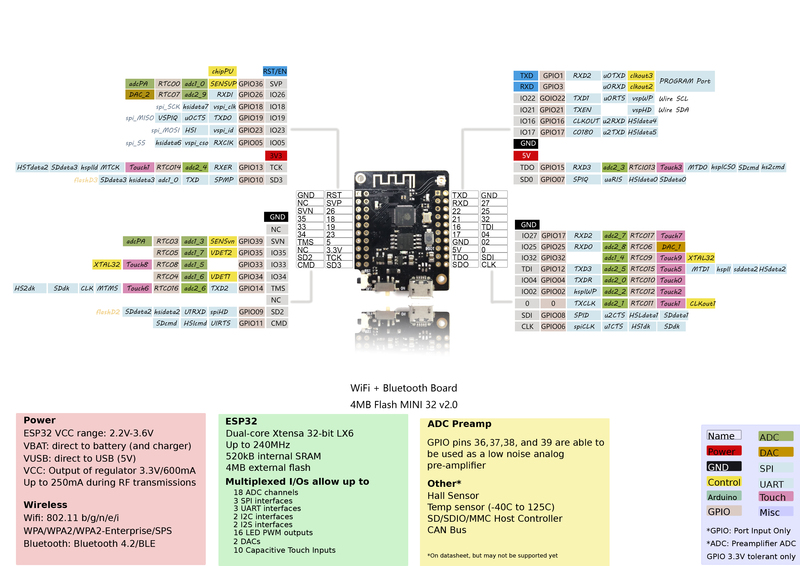 ESP32 and ESP8266 boards are similar, and you won’t feel almost any difference programming them using MicroPython. This means that anything you write for the ESP8266 should also run with no changes or minimal changes on the ESP32 (mainly changing the pin assignment). In this section we’ll give you an overview of the uPyCraft IDE software, so that you can start programming the ESP32/ESP8266 with MicroPython. The IDE is a software that contains tools to make the process of development, debugging and upload code easier. There are many ways to program your ESP board with MicroPython. We’ve chosen uPyCraft IDE because it is simple and intuitive to use and works great with the ESP boards. This section shows several folders and files. The device folder shows the files that are currently stored on your ESP board. If you have your ESP32 or ESP8266 connected via serial to uPyCraft IDE, when you expand the device folder, all files stored should load. By default, you should only have a boot.py file. To run your main code, it is recommended to create a main.py file. main.py: this is the main script that contains your code. It is executed immediately after the boot.py. The sd folder is meant to access files stored on SD cards – this is only works with boards like the PyBoard that come with an SD card slot. The uPy_lib shows the built-in IDE library files. Finally, the workspace is a directory to save your files. These files are saved in your computer in a directory defined by you. This is a specially useful to keep all your files organized at hand. When using uPycraft for the first time, to select your working directory, click the workspace folder. A new window pops up for you to chose your workspace path. Create a new folder or select an existing folder to be your working directory. Then, go to File > Reflush Directory to update the directory. Note: to change your user directory, simply go to Tools >InitConfig and click the workspace directory folder to chose a different path. The Editor section is where you write your code and edit your .py files. You can open more than one file, and the Editor will open a new tab for each file. Clear: clear the Shell/terminal window messages. To get you familiar with the process of writing a file and executing code on your ESP32/ESP8266 boards, we’ll upload a new script that simply blinks the on-board LED of your ESP32 or ESP8266. 1. Go to Tools > Board and select the board you’re using. 2. Go to Tools > Port and select the com port your ESP is connected to. 3. Press the Connect button to establish a serial communication with your board. It should print the “Hello” message. Only if you see that message, you can continue with this tutorial. Otherwise, make sure you have established a serial communication with your board or that you’ve flashed successfully the MicroPython firmware on your board. 1. Press the “New file” button to create a new file. 2. Press the “Save file” button to save the file in your computer. 6. The device directory should now load the main.py file. Your ESP has the file main.py stored. 4. You should see a message saying “download ok” in the Shell window. We’ve discovered some common problems and error messages that occur with uPyCraft IDE. Usually restarting your ESP with the on-board EN/RST button fixes your problem. Or pressing the uPyCraft IDE “Stop” button and repeating your desired action. In case it doesn’t work for you, read these next common errors and discover how to solve them. Unplug, and plug back your ESP board. Then, double-check that you’ve selected the right serial port in the Tools > Serial menu. Then, click the “Connect/disconnect” button to establish a serial communication. You should now be able to upload a new script or re-run new code. This error might also mean that you have your serial port being used in another program (like a serial terminal or in the Arduino IDE). Double-check that you’ve closed all the programs that might be establishing a serial communication with your ESP board. Then, unplug and plug back your ESP board. Finally, restart the uPyCraft IDE – try to select the serial port in the Tools > Serial menu. Error #2: Trouble uploading a new script. already in download model,please wait. Press the “Stop” button in uPyCraft IDE (1 or 2 times) to make sure any code that was running stops. After that, press the “Download and run” button to upload the new script to your ESP board. Ready to download this file,please wait! It means the new file was uploaded to your board successfully. You can notice that it printed the “download ok” message. Press the ESP on-board “EN/RST” button to restart your board and re-run the new uploaded script from the beginning. Or not enough power provided by the computer USB port. Solution: try a different shorter USB cable (with data wires), try a different computer USB port or use a USB hub with an external power supply. Important: if you keep having constant problems or weird error messages, we recommend re-flashing your ESP board with the latest version of MicroPython firmware: Flash/Upload MicroPython Firmware to ESP32 and ESP8266. Error #5: When I try to open a serial communication with the ESP32/ESP8266 in uPyCraft IDE, sometimes it prompts the “Burn Firmware” window asking to re-flash the MicroPython firmware. Basically, we think this is what’s happening: when you’re running a script in your board, sometimes it’s busy running that script and performing the tasks. So, you need to try opening the COM port multiple times or restart the ESP to catch it available to establish the serial communication with uPyCraft IDE. If you’re running a script that uses Wi-Fi, deep sleep, or it’s doing multiple tasks, I recommend trying 3 or 4 times to establish the communication. If you can’t, I recommend re-flash the ESP with MicroPython firmware. We hope you’ve enjoyed learning how to program the ESP32 and ESP8266 boards using MicroPython firmware. If you want to learn more about MicroPython, take a look at our eBook: MicroPython Programming with ESP32 and ESP8266. Does the firmware have to be re-flashed if you decide to go back to using the Arduino IDE? To get back using Arduino IDE, so simply need to upload any code using Arduino IDE. Thank you so much for this tutorial. After flashing my esp with micropython, is it possible for me to program it with arduino ide again? Yes. You just need to upload code using Arduino IDE and it is ready again to use Arduino IDE. Amazing tutorial! Great stuff. Thanks Rui! I thought I had followed a tutorial here using micro python on ESP32 that set a PWM output on the ESP32. I’m trying to find that tutorial but not having much luck. My blink LED script doesn’t work. I have TTGO MINI 32 V2.0 ESP32 board. Not sure if the pin 2 is the right LED pin for my board. I’ve never used that board. But I was able to find the schematic diagram. For what I can tell, it seems that the built-in LED for your board is GPIO22. so, you just need to change the code to assign GPIO22 instead of 2. Can you try it and see if it solves your problem? Thanks for the clear tutorial, my ESP32 is blinking nicely. I am interested in the course/book, what is it with ‘currently closed for the general public’? Can you offer some suggestions how to proceed learning micropython? At the moment, the MicroPython eBook is only available for those of have already bought one of our courses before (they have access to RNTLAB dashboard). when I want to save my main.py file It doesn’t do anything. The “saved” file is not there and It doesn’t show me any errors either. You need to save the file first, before you are able to upload the file to your board. Fist, save the file by clicking the “Save” icon. Call the file “main.py”. Then, click the upload button to upload the code. I think it is more intuitive to use and less prone to these kind of errors.